Front row (left to right): 1. Glen Mooney, 2. John Aflague, 3. unidentified, 4. Paul Chalplic, 5. Gary Butterfield, 6. Dennis Richardson, 7. Finis Hudson, 8. Gary Saunders, 9. unidentified. Second row: 1. Dolores Banuelos, 2. unidentified, 3. Emmalie Millsap, 4. unidentified, 5. Susan McLaughlin, 6. Karen Butts, 7. unidentified, 8. unidentified, 9. Carolyn Yanes. Third row: 1. Pat Potter, 2. Lois Anderson, 3. Mary Norwood, 4. Beatrice Maitans, 5. Janet Newkirk, 6. Marilyn Steele, 7. Carol Paleto, 8. Joanne Moomau, 9. Judy Thonack. Fourth row: 1. John Foscalino, 2. Jim Strom, 3. Frank ?, 4. Mary Ruth Wallace, 5. unidentified, 6. Paul Armstrong, 7. Dahl Stanford, 8. unidentified. Credits: From the collection of Susan (McLaughlin) Beus. Scanned for Susan by Dahl Stanford. Thanks to Susan and Dahl for identifying the kids in this picture. 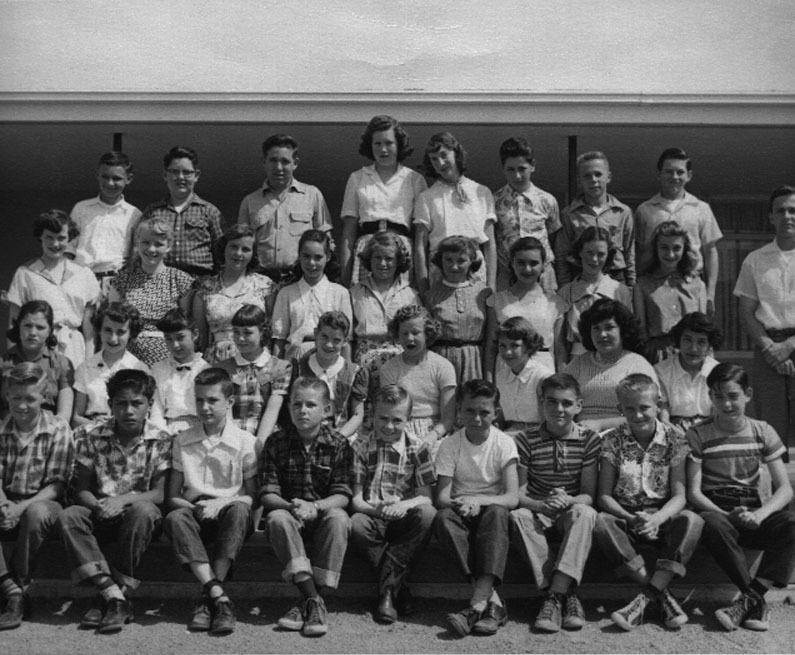 The kids in the picture are members of the high school graduation class of 1959. To find other pictures of the class of 1959 in the archive, see Livermore class pictures listed by year of high school graduation: 1959. And if you have any pictures of the class of 1959 that you would like to share, please submit them to the Archive. To find other pictures from Junction Avenue School in the archive, see Livermore class pictures listed by school: Junction Avenue School. And if you have any pictures from Junction Avenue School that you would like to share, please submit them to the Archive.